Monarch Air Group provides private air charter in Syracuse, NY. Our clients benefit from top-notch service, unrelenting dedication to safety, wide selection of aircraft, and years of experience in chartering private jets. To obtain a free quote, please use our online quoting tool provided below, or call toll free 1-877-281-3051. Monarch Air Group provides private jet charter flights in and out of Syracuse, New York, USA. Syracuse is a city in New York, southeast of Lake Ontario. 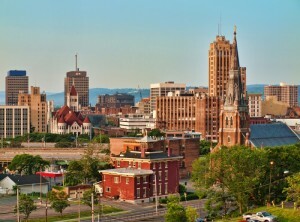 With a population of about 145,170 people, Syracuse is the 5th most populous city in the state of New York and the 167th largest city in the country. It is a home to a major research university – Syracuse University, the city’s largest employer – the Upstate Medical University and Hospital, SUNY Environmental Science and Forestry and some other colleges and professional schools. In 2010 Syracuse was rated by Forbes as the 4th in the top-10 places to raise a family. The most notable points of interest include Hanover Square, University Hill, Everson Museum of Art, The Warehouse Gallery, Milton J. Rubenstein Museum of Science and Technology, and much more. The city is served by Syracuse Hancock International Airport (SYR / KSYR), which is located 8 miles from the city center. 1. ART, Watertown, Watertown, United States. 2. BGM, Greater Binghamton, Binghamton, NY, United States. 3. COP, Cooperstown – Westville Airport, Cooperstown, NY, United States. 4. CTX, Cortland, Cortland, United States. 5. ITH, Tompkins County, Ithaca, United States. 6. OIC, Eaton, Norwich, United States. 7. ONH, Municipal, Oneonta, United States. 8. RME, Griffiss AFB, Rome, NY, United States. 9. SXY, Sidney, Sidney, United States. 10. SYR, Syracuse Hancock International Airport, Syracuse, United States. 11. UCA, Oneida County, Utica, United States. 12. YDK, Main Duck Island, Main Duck Island, Canada. 1. ParkView Hotel, 713 East Genesee Street, Syracuse. 2. ParkView Hotel, 713 East Genesee Street, Syracuse. 3. Sheraton Syracuse University Hotel & Conference Center, 801 University Avenue, Syracuse. 4. Crowne Plaza Hotel Syracuse, 701 East Genesee Street, Syracuse. 5. Genesee Grand Hotel, 1060 E Genesee St, Syracuse. 6. Genesee Grand Hotel, 1060 E Genesee St, Syracuse. 7. Pascale’s Bakehouse at The Hotel Syracuse, 500 South Warren Street, Syracuse. 8. Reissance Syracuse Hotel, 701 E Genesee St, Syracuse. 9. ParkView Hotel, 713 East Genesee Street, Syracuse. 10. ParkView Hotel, 713 East Genesee Street, Syracuse.